Research supports the idea that children benefit physically, emotionally and socially from regular contact with companion animals. Children often prefer to share their feelings and emotions with a pet, rather than with another person. Contact with companion animals has been shown to be important in several areas of child development and health – for example, in promoting self-esteem and encouraging the development of humane attitudes, such as empathy and nurturing. Studies have also demonstrated the importance of pets offering social support particularly during transitional periods such as during adolescence or periods of family illness or breakdown. 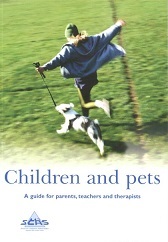 Children and Pets, A guide for parents, teachers and therapists. Note: This book is currently not available to purchase – please do not place an order at this time, as it cannot be fulfilled.